The Killeen Police Department will be hosting its 42nd Citizen’s Police Academy with classes beginning on March 6th, 2017 and continuing through May 22nd, 2017. Classes will be held on Monday evenings from 7:00pm until 10:00pm and one additional class on Saturday, April 29th. There will be a total of twelve weeks of instruction, including presentations of the functions and operations of the departments various investigative and administrative divisions. It is an educational and informative program that allows citizens the opportunity to learn about the issues that affect law enforcement efforts in the City of Killeen. Applications will be available at the Killeen Police Department beginning Monday, January 24, 2017; the deadline for applications will be Friday, February 24th, 2017, at 5:00pm. Applicants must agree to submit to a background check which includes a criminal history inquiry. There is no cost to anyone who enrolls. For more information on the Citizen’s Police Academy, contact Tammy Moseley at the Killeen Police Department by telephone at 254-501-8805 or email tmoseley@killeentexas.gov. Killeen Police investigate a convenience store robbery. Officers responded to the 7-Eleven Convenience Store located 1814 N W S Young Dr. on Tuesday, November 15, 2016, at 2:55am, after receiving a call from the clerk advising the store had just been robbed. Upon the officers’ arrival, they were told that a black male, entered the store and began causing a disturbance with the clerk. The suspect displayed a handgun and demanded money from the clerk; he then fled on foot in an unknown direction. 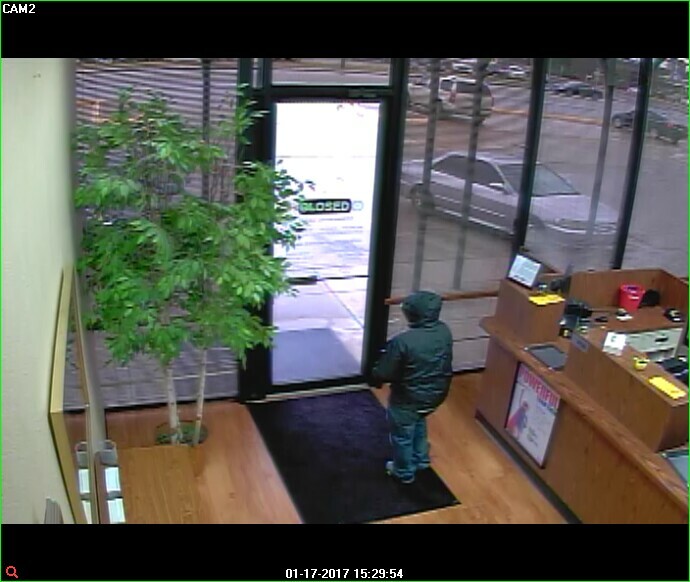 The suspect is described as a black male, approximately 6’ tall, wearing a dark hooded jacket, dark pants, black and red shoes and sunglasses. Detectives are asking anyone who has information about this robbery or if you can identify the suspect in the surveillance video, to contact Crime Stoppers at 254-526-TIPS (8477) or go online at www.bellcountycrimestoppers.com. You can also download the P3Tips App for IOS or Android and give an anonymous tip. All information is anonymous and confidential and if your tip leads to the arrest of the suspect, you could be eligible for a reward up to $1,000 in cash. Detectives with the Criminal Investigations Division, Violent Crimes Unit, continue to investigate this case and will release further information as it becomes available. UPDATE – The male who was shot by a Killeen Police Officer has been released from Baylor Scott & White Hospital. Thomas Eugene Meyers was taken into custody and charged with Possession of a Controlled Substance, Unlawful Possession of a Firearm by a Felon, Assault with Bodily Injury Family Member, Motion to Revoke Probation for a prior Possession of a Controlled Substance. Justice of the Peace Claudia Brown arraigned Meyers and set his bonds accordingly – $50,000 for the Possession of a Controlled Substance, $50,000 for the Unlawful Possession of a Firearm by a Felon, $10,000 for the Assault with Bodily Injury Family Member, and $20,000 for the Motion to Revoke Probation for the prior Possession of a Controlled Substance. He was transported to the Bell County Jail where he currently resides. The officer involved in this shooting has been cleared and will return to work. Killeen Police investigate an Officer involved shooting on Cedarhill Drive. Officers responded to the 1800 block of Cedarhill Drive on Monday, January 16, 2017 at 9:24am, after receiving a 911 call in reference to a domestic dispute between a male and female; the male had previously left the residence. The officer arrived and began speaking to the female when the male returned and was armed. There was a confrontation between the officer and the armed male and the officer shot the male. He was transported to the Baylor Scott & White Hospital in stable condition. There were no other injuries during this confrontation. Detectives with the Criminal Investigations Division, Violent Crimes Unit, continue to investigate this incident and information will be released as it becomes available. As per Killeen Police Department policy, the officer involved in this incident has been placed on administrative leave as this case is investigated. 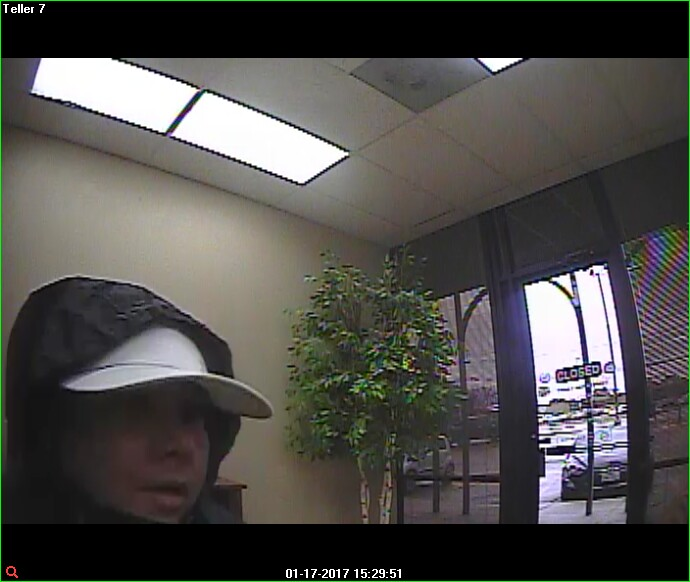 Killeen Police investigate afternoon bank robbery on Trimmier. Officers responded to 2201 Trimmier Rd. on Tuesday, January 17, 2017, at 3:31pm, after receiving a 911 call letting them know the 1st National Bank had just been robbed. Officers were advised a short, heavyset, white or light skinned Hispanic female, entered the bank and gave the teller a note that demanded money. 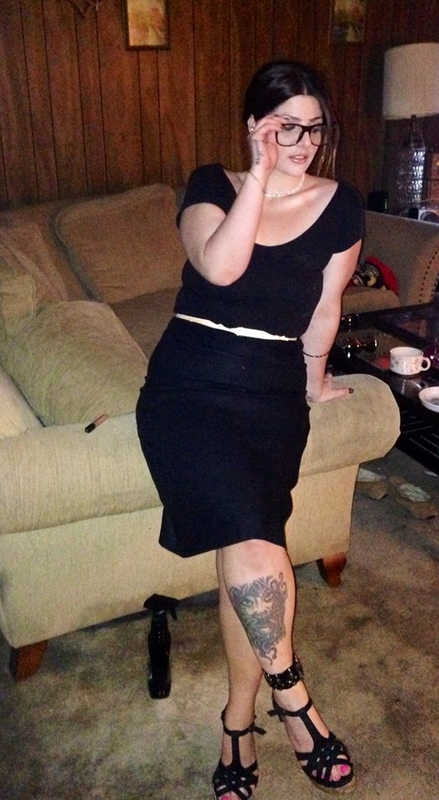 The suspect made reference to a weapon however, she did not display one. 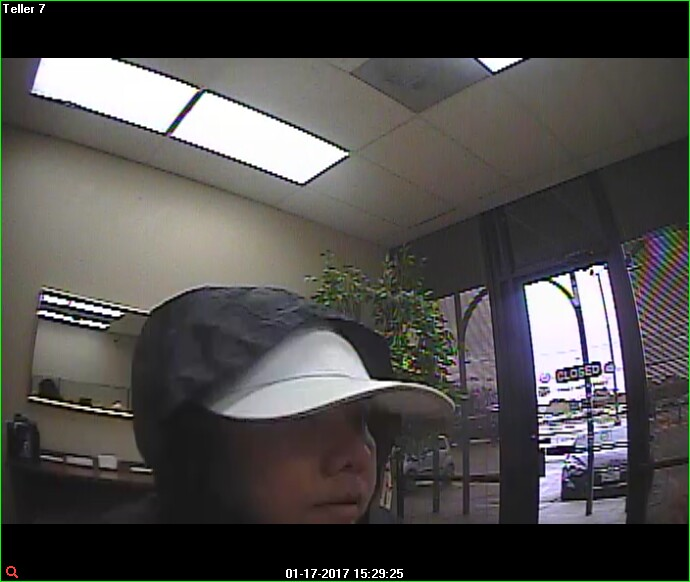 She then fled on foot from the bank with an undisclosed amount of money. 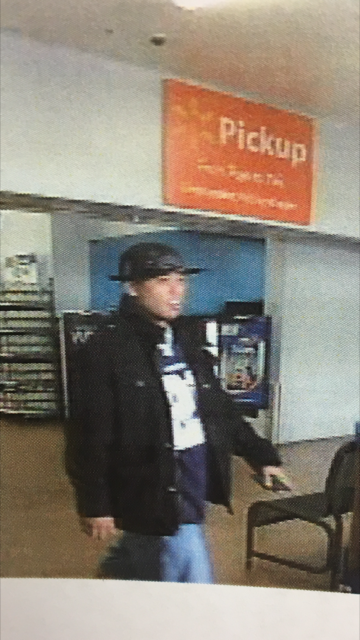 The suspect was wearing a white low profile Starter cap, a black hooded jacket with a white stripe across the chest area and blue jeans. 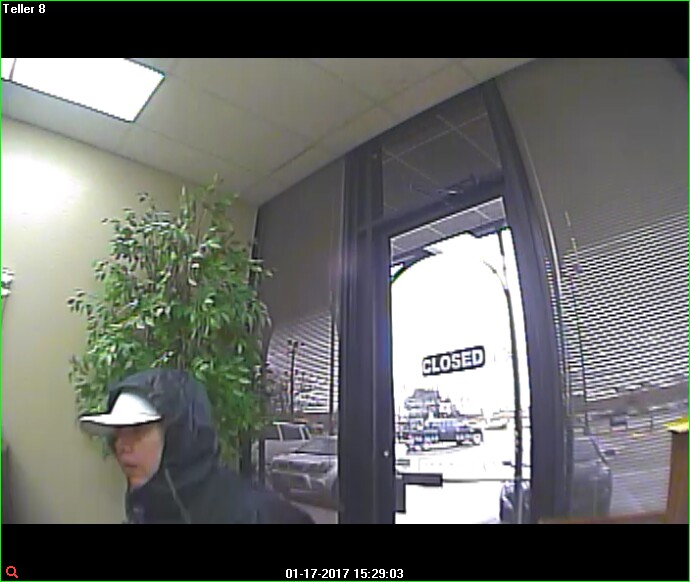 Detectives are asking anyone who has information about this Bank Robbery or can identify the suspect, to contact Crime Stoppers at 254-526-TIPS (8477) or go online at www.bellcountycrimestoppers.com. You can also download the P3Tips App for IOS or Android and give an anonymous tip. All information is confidential and anonymous and if your tip leads to the arrest of the person responsible, you could be eligible to receive a reward up to $1,000 in cash. Detectives with the Killeen Police Department CID Violent Crimes Section continue to investigate this case and will release information as it becomes available. Killeen Police detectives are interested in speaking with a female regarding the homicide on Bonnie Drive. Detectives with the Killeen Police Department Criminal Investigations Homicide Division are interested in speaking with a Danielle Knight. They believe she has information that would be pertinent to the Homicide investigation where 41 year old Jason Francisco Munayco, was found deceased in the 1300 block of Bonnie Drive, on Friday, December 9, 2016. Detectives are asking anyone who has information about this death or knows the whereabouts of Nichols to contact Crime Stoppers at 254-526-TIPS (8477) or go online anonymously at www.bellcountycrimestoppers.com. You can also download the app P3 tips for IOS and Android phones. All information is anonymous and confidential. Killeen Police investigate an early evening Homicide on Brownsville Drive. Officers received calls from people who heard numerous shots fired in the area of Brownsville Drive at 6:18pm, on Monday, January 16, 2017. While officers were responding to the area, they were told that there was now a gunshot victim. Officers arrived in the 3200 block of Brownsville Drive to find a 31 year old male lying in the roadway. Justice of the Peace Claudia Brown pronounced the victim, Harry Louis Polite III, deceased at the scene and ordered and autopsy to be performed at the Southwestern Institute of Forensic Sciences in Dallas. Detectives are asking anyone who has information about this shooting, to contact Crime Stoppers at 254-526-TIPS (8477) or go online at www.bellcountycrimestoppers.com. You can also download the P3Tips App for IOS and Android and give an anonymous tip. All information given is anonymous and confidential, and if your tip leads to the arrest of the person responsible for this Homicide, you could be eligible for reward up to $1,000 in cash. Detectives with the Criminal Investigations Division, Homicide Unit, continue to investigate this case and will release further information as it becomes available. Killeen Police investigate Homicide on Taree Loop. Officers responded to the 6500 block of Taree Loop on Wednesday, January 11, 2017, just after 9:00pm, in reference to shots fired. While the officers were responding, they were notified that there was now a shooting victim. Upon the officers arrival they located a 36 year old male suffering from a gunshot wound in the driveway of a residence in the 6500 block of Taree Loop. Justice of the Peace Bill Cooke pronounced the victim, Eric Dieter Hill, of Killeen, deceased at 9:54pm and ordered an autopsy to be performed at the Southwestern Institute of Forensic Sciences in Dallas. Detectives with the Homicide Unit continue to investigate this case and will release information as it becomes available. Detectives are asking anyone who has information about this shooting to contact Crime Stoppers at 254-526-TIPS (8477) or go online at www.bellcountycrimestoppers.com. You can also download the P3Tips App for IOS and Android and give an anonymous tip. All information given is anonymous and confidential, and if your tip leads to the arrest of the person responsible for this Homicide, you could be eligible for reward up to $1,000 in cash. Killeen Police need help identifying a couple of thieves. Officers responded to the Freedom Jeep Used Cars located at 3620 E. CTE, on Friday, November 25, 2016. The officers were told the business had been burglarized and several items had been taken. On Saturday, November 26, 2016, a representative from the Freedom Jeep Used Cars reported that during the burglary they also realized that a 2015 Jeep Cherokee had been stolen. Officers were patrolling the area in the 200 block of E. Bryce Avenue, on Tuesday, December 27, 2016, they located a gray 2015 Jeep Cherokee that appeared to be abandoned. When the officers ran the license plate to locate the owner, they learned the vehicle was stolen. 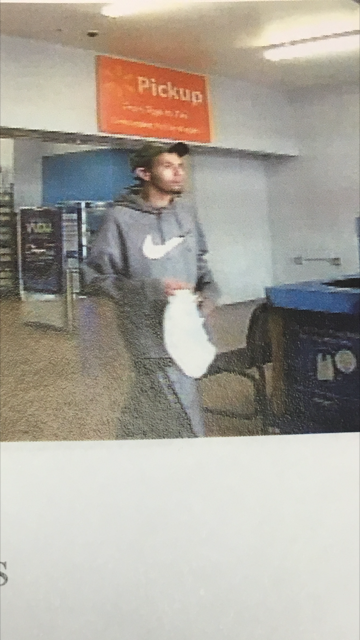 Through the investigation, detectives learned that the two males shown were seen driving the stolen Jeep Cherokee. Detectives are asking anyone who can identify these suspects to contact Crime Stoppers at 254-526-TIPS (8477) or go online at www.bellcountycrimestoppers.com. You can also download the P3Tips APP for IOS and Android and give an anonymous tip. All information is anonymous and confidential and if your tip leads to the arrest of the suspects involved in this case, you could be eligible for a reward up to $1,000 in cash. Killeen Police respond to several early morning convenience store robberies. Officers responded to the 7-Eleven located at 1001 Willowsprings Road at 2:38am, after receiving a call that the store had been robbed. The officers were told that a black female and two black males entered armed and demanded money; the suspects fled on foot. They were all last seen wearing black and gray hoodies. No injuries were reported. Officers responded to the Mickey’s Store located at 2101 S. WS Young Drive at 3:38am, after receiving a call that the store had been robbed. The officers were told that a black female and two males entered armed and demanded money; the suspects fled on foot. They were all last seen wearing black and gray hoodies. No injuries were reported. Officers responded to the 7-Eleven located at 620 S. Fort Hood Street at 3:59am, in reference to an attempted robbery. The officers were told that a black female and two black males approached the store clerks and for unknown reasons, the suspects fled the area without receiving anything. They were last seen wearing black and gray hoodies. No injuries were reported. Officers responded to the 7-Eleven located at 3600 Clear Creek Road at 6:33am, in reference to an attempted robbery. The officers were told that the store clerks observed three subjects with masks approach the store and for unknown reasons, the suspects fled the area without receiving anything. Detectives believe all four incidents involved the same suspects. Detectives are asking if anyone has any information on these robberies or can identify these suspects to contact Crime Stoppers anonymously at 254-526-TIPS (8477) or go online anonymously at www.bellcountycrimestoppers.com. You can also download the P3tips app for IOS and Android to give an anonymous tip. All information is confidential and anonymous and if your tip leads to the arrest of the suspect(s), you could be eligible to receive a reward up to $1,000 in cash.